Fear is a powerful motivator for practically anything. And when Exeter High School parents were fearful their child was in danger last month, a wave of them crashed the assembly and swept their kids out of the stands; despite the purpose of the assembly to notify students that whatever rumored threat they have heard was investigated and unfounded. Despite trying to avoid the situation of panic all week, it found its way in even after the rumor of a “hit list” was dispelled on Thursday, Feb. 22. By Friday the 23rd, a second rumor descended students and parents into chaos for a number of reasons, but the chief one being information. During last week’s Thursday town hall, superintendent Tim Hire fielded questions about the hit list rumor. Parents who were not aware of the investigation wondered why they weren’t brought into the loop. Hire’s ultimate point was there was no need to create a situation of mass panic by bringing in those unaffected by the situation, which is a point of view most managers in any industry can get behind. Since the hit list rumor was found to be completely unfounded, it appeared as if the administration made the right call. But by the next day, the second rumor of a school shooter plotting to attack at an assembly wreaked havoc on the anxieties of students and parents on pins and needles in the wake of yet another devastating school shooting in Parkland, Fla. Hire said during the town hall the assembly was impromptu and there was again no evidence that a second shooting threat was credible. He said as well the district wanted to take every precaution by having the Police Department on hand just in case anyone had over looked the seedlings of a credible threat. Unfortunately, the assembly and officers fueled the fires of fear circulating throughout the gym. Worse yet, parents only had their students’ fearful imagination to decide whether they should rush toward the school in an attempt to save their child or not. And during the town hall parents wanted to know what was happening, when it was happening and what to do about it. While parents are completely within their human rights to worry for the safety of their child, the unfortunate reality is complete and accurate information travels much slower than the fears of parents who believe their child is in real danger. And while patience and resolve is hard to gather in times of stress, it is nonetheless required if what parents want to know is what is going on. Because as events unfold the only people available to make sense of them are the administrators and teachers entrusted with your student’s safety. One parent in the crowd voiced their understanding of this fact, saying there is not a principal on call trying to find someone to put out a PSA while something like this is going on. “It just isn’t going to happen,” the parent said. There is more truth to that than most people consider. As a point of fact, there is not one person dedicated to every contingency a school district has to account for. Instead administrators and teachers wear a myriad of hats on a daily basis and have to choose the right one in each situation. 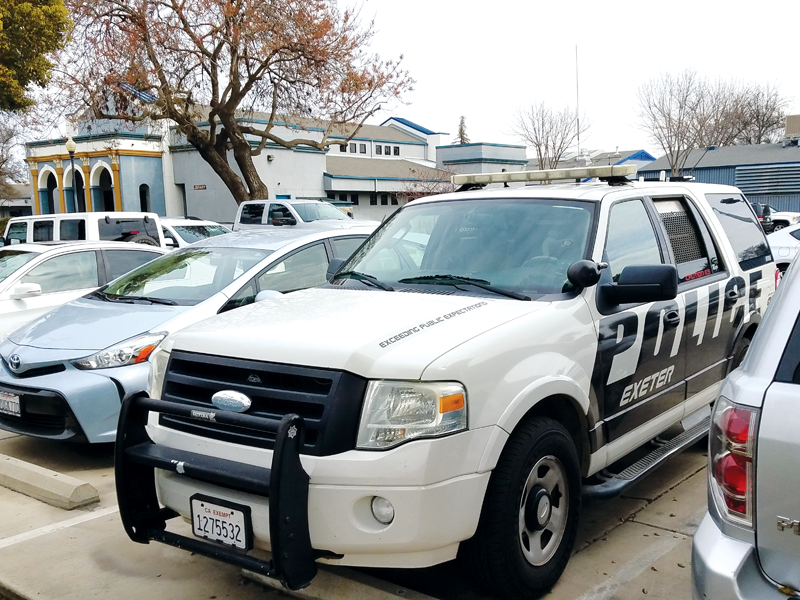 It could be argued that Exeter Unified took as many precautions as they could on Friday when they invited officers to stand guard to provide a sense of safety. Parents at the town hall offered suggestions for ways the district can distribute information, but the true problem isn’t the mechanisms the district used to disseminate information, in fact those worked just fine. The District issued an automated phone message less than three hours after the second rumor began to run amok. And to track down, investigate and verify the invalidity of a rumor spread throughout a high school between 8 a.m. and 12 p.m. is by all accounts fast. Some parents said they immediately went to social media to gather additional information on the shooting. And on that particular Friday there may be no better demonstration of the fear inflaming proliferation machine we call social media. As it happens, a strikingly similar case was unfolding in Exeter, New Hampshire, where their police department and their high school were also investigating a supposed hit list on the same day at about the same time. Sources within the community said parents were sharing the article believing it was Exeter, California. The take away when it comes to information is simply that it is not always available when you want it or need it. And being selective with what information you release is just as important as what the information is. Parents and students who were not on a rumored hit list that turned out not to exist were not given notice because they were not in any suspected danger. As Hire put it, you wouldn’t call an assembly to notify people that there is not a threat, using drug dealing as an example. And by Friday, when word let out over a second rumor, the district released information to parents once they were able to dispel it. In the mean time the district also let about 400 students go home no questions asked understanding their fear at this particular juncture of American life in the time of school shootings. So if there is something to change if this situation were to occur again, it is not the information mechanisms or how it was released.